Apple Pickle: Last week i bought some red apples and they tastes similar to green apples; they are sour in taste. So no one is ready to finish those apples. 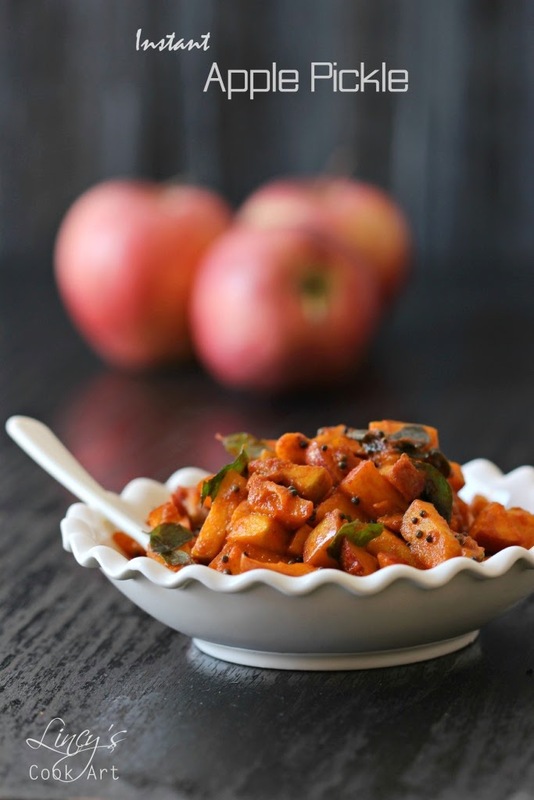 Apple pickle has been there in my to do list for long time and i thought this is the best time to try with these sour apples. I have prepared this pickle in an instant way and it turned out really yummy. Spiciness from the masalas and the mild sweetness and the flavour from the apple really gives an unimaginable taste. We loved this pickle a lot and i have finished half of the pickle the day i have prepared itself. So fast moving pickle when compare to other pickles. Kids too love this pickle as its is spicy and also mildly sweet. Cut and core the apples to remove the seeds and cut them into a small bite sized pieces and keep in a bowl. Squeeze the lemon juice over the cut apple and allow to coat well to avoid browning of apples. Roast some fenugreek seeds till light golden colour, till you get the roasted aroma. In a pan heat the oil and splutter the mustard seeds. Then add the cut garlic and curry leaves and roast in the oil till the colour of the garlic edges starts to get golden colour. Now add the asafetida, turmeric powder, red chilli powder and half a teaspoon of roasted fenugreek powder. Switch off the gas immediately after adding and mix all these spices in the hot oil to cook to leave the raw smell of the spices. Allow the mixture to cool thoroughly and transfer the pickle on an air tight container. Keep the pickle out side for an hour to absorb the masala. Then refrigerate the pickle and finish with in a week time. Oh wow apple pickle sounds great...it looks fingerlicking good ! this is one awesome dish..